Skansen Smaków is not the kind of restaurant we usually review in the Krakow Post, which is a shame, since it is the kind of restaurant that most Poles actually visit. This epic-scale log cabin on a lake represents a perfect example of a true Polish cultural phenomenon – the karczma, or what we would call a country inn or tavern in the English-speaking world. Like most things in the Polish countryside, Skansen Smaków is a modern interpretation of an old idea. The name is particularly revealing. ‘Skansen’ is a word that has no direct equivalent in English. It means something like ‘heritage museum,’ and comes from the Skansen Museum opened in Stockholm, Sweden, in 1891 – a sort of living theme park intended to demonstrate pre-industrial ways of life. 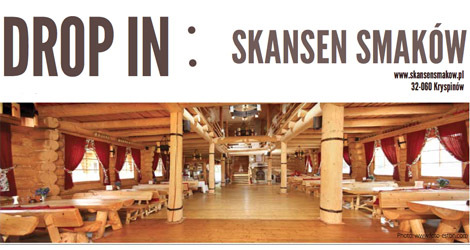 Thus, Skansen Smaków, implies a heritage museum of flavours – it’s comfort food multiplied by nostalgia. The building itself is an amplified version of traditional Góral architecture – the kind of thing that gives architectural purists nightmares, but which real people rather like. The interior is a vast space that glows with golden pine. Everything is made of wood – it’s not the kind of place to come if you have a phobia of splinters. The tables are long, split logs with full-length benches down each side, perfect for gathering the entire family – dogs, distant uncles and all. Out back is another large eating area with a view down to Krispinów Lake that is only slightly marred by the intervening car park. Like everything at Skansen Smaków, convenience and a lack of nonsense take priority – a refreshing attitude if you’re more used to the trappings of hip Krakow dining. The menu, unsurprisingly, promises the culinary equivalent of a majestic horde of winged hussars sweeping in to relieve Vienna. All the classics are here – kotlet schabowy the size of your torso, beer-baked golonka that looks like it has been hewn from an extinct species of mega-hog – but there is also fish, pancakes, and plenty of veg. The food comes in huge portions and is, frankly, delicious. The prices, like everything else, are family friendly, with mains ranging from 16 to 25zl and all items on the kids’ menu under 20zl. The back garden features a proper play area, and there is also a play corner inside. Far more useful for kid wranglers is the huge open space in the middle of the restaurant, where future knights and dames of Poland can charge about in full view without getting in anyone’s way. I admit I was skeptical about Skansen Smaków. For a townie like me, used to restaurants that aim for an urbane, unconcerned chic, it looked kitsch and disingenuous. In fact, I enjoyed it immensely. 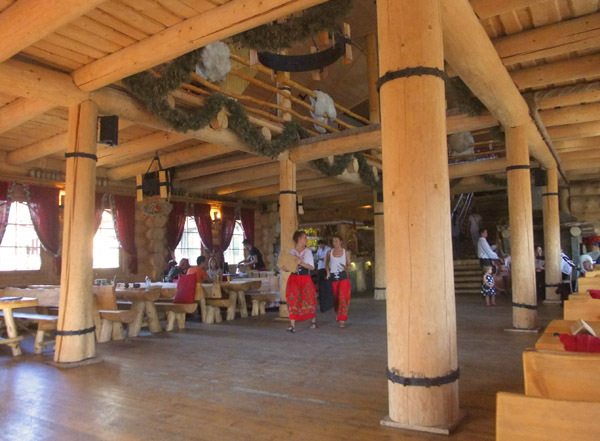 Skansen Smaków knows what it is and makes no apologies – it’s a genuine reflection of modern Poland and modern Poles serving good food in a friendly atmosphere to people living busy lives. If you live in or are visiting Poland, missing this is missing something fundamental about Polish culture that you will never find in the archly-Bohemian cellars of Kazimeirz. Skansen Smaków backs on to Kryspinów Lake, a popular getaway from the city only a few minutes by car. If you’re going by public transport, the 209 bus from Salwator goes past the restaurant and takes less than 20 minutes. Fun is, I have visited them today in search of shashlyk which is unfortunately you can’t get anywhere in Poland. Except that it looked rather good.